Funny thing; Taryn Manning’s brief description on her Twitter profile is “Yeah I’m in that movie and also on that show, and yep that’s me doing all that music n stuff too.” That very well might be one of the most accurate summaries on the site. In all seriousness, I’d like to bet the majority of you have seen Manning on the big screen, in a TV show or heard a Boomkat song before. Manning’s accomplished quite a bit over the years and shows no signs of slowing down, as her repertoire continues to grow. The latest edition to Manning’s resume? The movie The Perfect Age of Rock ‘n’ Roll, due out in theaters and on demand on August 5th. The films stars Kevin Zegers as Spyder, a guy who ditches his hometown to hit it big in the music industry. Sure, his first record is a hit, but without his song writing buddy, Eric (Jason Ritter), by his side, his second go is nothing short of a disaster. In an effort to make a comeback, Spyder heads back home to make amends with Eric and make his third album a hit, together. Manning steps in as Rose, Spyder’s manager who’s just about fed up with his antics. For Rose, Eric’s presence isn’t only promising in terms of Spyder’s career, but possibly on a romantic level, too. So far, so good for The Avengers this summer. Thor’s a pretty cool guy and now it’s Captain America to show off what he’s got. Sure, he comes with the superhero standards – buff body, noble intentions and a sleek costume – but other than that, he’s nothing more than a poster boy for Marvel movies. Steve Rogers makes for a better propaganda symbol than superhero. Chris Evans is Steve Rogers, a Brooklyn native desperate to serve his country. Sadly, his intense determination isn’t enough to make up for his slight stature and asthma, amongst other physical deficits, and his enlistment application is stamped with a big red F, time and time again. It isn’t until Steve crosses paths with Dr. Abraham Erskine (Stanley Tucci) that he finally gets the chance to prove himself, well, an enhanced version of himself. Erskine straps Steve to some high tech contraption, pumps him full of glowing blue fluid and so Captain America is born. Meanwhile, Hitler is building the ultimate weapon for himself, or so he thinks. The Nazi regime funnels resources into their deep science division, Hydra, in hopes that the unit’s leader, Johann Schmidt (Hugo Weaving), will deliver a power the Allies cannot defeat. Problem is, Schmidt is obsessed with some sort of otherworldly power, a power his cohorts don’t believe in. When Hitler attempts to shut Hydra down, Schmidt, or Red Skull, is ready to take the reigns and conquer the world for himself. The only one who can stop him? Guess who. The Devil’s Double has two things going for it, it’s inherently fascinating to watch one man play two roles in the same movie and it claims to be “the real story of the man who was forced to become the double of Saddam Hussein’s sadistic son.” If this is really exactly how things went down for this man, the movie’s a worthwhile watch for that reason alone, to get an inside look. Too bad this inside look doesn’t make the true tale as rousing as it could have been. Dominic Cooper is both Latif Yahia and Uday Hussein. The son of Saddam Hussein, Uday is in need of a body double and with the help of a few cosmetic adjustments, Latif is the perfect match. Should Latif take the gig, he’ll enjoy all the luxuries that Uday abuses on a regular basis – expensive watches, the finest clothing, as many women as he’d like and more. The catch is, Latif must leave his old life behind and entirely devote himself to Uday. Well, actually this isn’t exactly a deal in need of accepting. The day Uday summons Latif, Latif is dead and he can either live on as Uday or die for real. There’s no doubt that living in Uday’s shoes comes with perks, but, as time goes on, it gets harder and harder to ignore his childish and often violent behavior, especially when Uday demands Latif do his dirty work for him. With the Gulf War in the backdrop, The Devil’s Double tests the extent to which Latif will go to to preserve his ethics and save the people he loves. If you’re going to make a movie called Cowboys & Aliens, there better be some cowboys and aliens. In combining the two genres, the filmmakers had two options, miraculously create some sort of scenario that feels raw and believable or just go all out, embracing absurdities of both. Forget the fact that the former would have been a near impossible achievement; who wants to watch some schmaltzy drama about cowboys fighting aliens? The filmmakers not only go for the latter option, but they strive to outdo any expectations we might have formulated and, sure, it’s ridiculous, but the big screen is one of the best places to live out such a ridiculous fantasy. A man wakes up in the middle of the desert with a gash in his side and some ort of metal contraption on his wrist. He’s got no clue who he is, where he came from or what happened to him. It isn’t until he moseys into the nearest town that he discovers he’s a wanted man, Jake Lonergan (Daniel Craig). Too bad it’s the town sheriff (Keith Carradine) that makes the discovery, as Jake’s got no time to escape. Just before Jake’s about to be shipped out of town, Woodrow Dolarhyde (Harrison Ford) rides in demanding he serves Jake his justice as it’s his gold he stole. The boys are distracted from their bickering by strange lights in the distance. Within seconds, they’re dead overhead and aliens are raining down their firepower on the tiny Arizona town and snatching up the citizens. When the battle’s over Dolarhyde and his men saddle up to hunt down a wounded alien that could potentially lead them to their abducted loved ones. He insists on somewhat pushing his differences with Jake aside, as that shackle on his wrist turns out to be their only defense against the invaders. Also along for the ride is a mysterious woman named Ella (Olivia Wilde) who insists that she and Jake can work together to bring an end to this. San Diego Comic Con is officially behind us and this edition of Best/Worst Movie Promos proves it — as just one film featured on the list had a presence at the event. It’s not necessarily because the material that came out of SDCC was lackluster, but more so because much of the footage debuted during the panels has yet to hit the web – in non-bootleg form at least. Regardless, we still have a slew of material to sort through and while some received positions in the promotion and demotion departments, others find themselves floating in the abyss. Of the pieces in that middle ground, there are quite a few to note. In true Valentine’s Day fashion, New Year’s Eve follows that star-studded production up with a trailer packed with famous faces. As someone who didn’t appreciate the first film, this trailer doesn’t really do it for me, but clearly there’s a ton of moviegoers out there who enjoy some namedropping. On the other hand, both Happy Feet 2 and Dirty Girl are quite appealing, albeit in completely different ways. The Happy Feet 2 trailer features dancing penguins with baby voices. Enough said. As for Dirty Girl, Juno Temple gets crude in the best possible way. The trailer presents it as Easy A on the road, but with a more unique texture. As usual, Temple is mesmerizing and has no trouble upping the intrigue for this one. News has been rather slow lately, but, just in time for San Diego Comic Con Lionsgate opted to fire things up with a brand new poster (and a motion poster at that!) Love for The Hunger Games aside, this is a really beautiful piece of promotional material. As a standard stagnant design, it’s quite stimulating, boasting rich detail. Toss in the motion and music aspects and you’ve got something that’s not just fun to look at, but a piece with the power to convey the tone of the film. Funny thing, just like the concept of the Mockingjay catches on in the trilogy, it’s taking a similar course in reality. Had you not read the books, odds are you’d have no clue what this symbol means. However, those Mockingjay pins distributed at Comic-Con were one of the hottest swag items there. There were lines of people at the Lionsgate booth waiting for them on a regular basis and I’d like to bet a large majority weren’t even familiar with the source material. That being said, even though The Hunger Games didn’t light up Hall H, it still made quite the impact on SDCC. 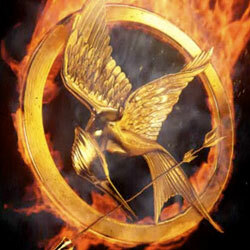 Lionsgate really deserves some credit in general. Not only was their booth effectively designed — with two floors and appropriate places for fans to attend signings and receive free goodies in an orderly fashion without clogging up the aisles — but the studio was just incredibly generous, something that goes a long way at an event like this. The employees were constantly handing out Hunger Games posters and Mockingjay pins and the booth was always abuzz with signing sessions, like one with Warrior’s Joel Edgerton and Tom Hardy as well as a Conan the Barbarian one with Jason Momoa. And, while the setup was constantly busy, it still always felt accessible. Cue cheesy movie trailer narrator voice! What happens when an alien race goes head-to-head with a group of boys from the block? Get ready for the ultimate in summer movie season mayhem, as you’re about to experience an epic adventure with guns, creatures from deep space and lots of blood. In all seriousness, <I>Attack the Block</I> is what every mega budget studio film should strive to be. Rather than use and abuse familiar concepts and trying to spice them up with flashy CGI, <I>Attack the Block</I> maintains an alien invasion’s entertainment value while infusing it with novel characters, refreshingly designed creatures and an abundance of laughs, resulting in an exceptionally innovative and entertaining experience. After a long day at work, Sam (Jodie Whittaker) heads home in the dark of night. Before she can reach her South London block, she comes face-to-face with Moses (John Boyega) and his crew. In the midst of snatching all of her valuables, the boys are distracted by a mysterious object making an explosive crash landing on top of a nearby car. Sam bolts, but Moses and his friends investigate and uncover the most out-of-this-world thing imaginable, an alien. After beating their discovery to death, the boys head home to the block to show off the corpse to Ron (Nick Frost) and his boss, Hi-Hatz (Jumayn Hunter), the area’s top drug dealer. While gloating, they catch site of another alien crash landing and head out to go two for two. However, this visitor isn’t an easy kill like the first and, before they know it, their block is crawling with bear-like black beasts with glowing teeth.